It was as cold as charity inside the admittedly rather lovely interior of Reading Minster and the pews are scarcely made for a long sit. So well done me for being super early and nabbing not only a seat up front only a few feet from the musicians, but also one of the only pews with a little padding. 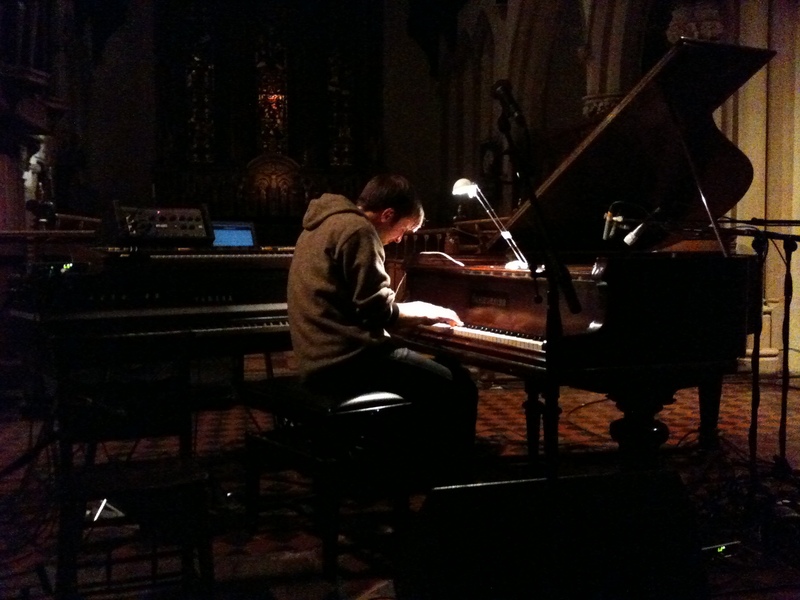 Without much ado Mr Frahm took his place behind the baby grand and his Yamaha and Roland (could it have been a Juno?) keyboards and gave us an hour and a quarter of some of the most mesmerising music. As a musician he becomes so absorbed, so connected to his instruments, he almost disappears at times, seems to forget where he is and what he is sitting on; oblivious to all else around. Of course as a pianist he is exceptional, his soft and fluid hands barely touching the keys at times and at others used as percussive tools to pull the sounds from the instruments. As for the set list, I have no idea, much was familiar, some was not, and it was truly wonderful to have someone of this calibre given the space to develop pieces, merge them with others in a way not possible in a recording. As with the last time I heard him it was an emotional and totally absorbing experience. Normally one for an eye for a picture for the blog and for the memory, it wasn’t until the last piece that I realised I had sat, rapt for over an hour and not even thought of a snap. There are times when words are not enough, unable to do justice to the event. My neighbour and I agreed that this was such an evening, much like the Mono with the Holy Ground orchestra show at Koko that we had both, separately, enjoyed. Nils Frahm is an exceptional and rare musician, already with a great catalogue of material (including the recent and wonderful Felt, clearly one of the albums of the year) tonight also gave us present the opportunity to get our hands on a copy of Juno as a 7″, written for Peter Broderick and recorded in one take on a Roland Juno keyboard, this is also obtainable through the good offices of the excellent Erased Tapes label. Extraordinary music from an extraordinary musician. This entry was posted in Uncategorized and tagged Erased Tapes, Leven Muster Collective, Martyn Heyne, Nils Frahm, The Pawnbroker, Trygghet. Bookmark the permalink. That was a great gig – best I’ve been to. Really good atmosphere and setting for the show. Did you ever post the recording?